Another great and very simple way to enjoy Kale, a highly nutrient dense vegetable. When Kale is cooked or baked, the bitter taste disappears. When these chips are dusted with brewers yeast or nutritional yeast, they taste cheesy. Feel free to experiment with other seasonings such as garlic, chili, curry etc. This recipe can also be used in a food dehydrator. Bake about 20 minutes or just until crisp but not burnt (keep an eye on them as they can burn quickly). Best to mix up or turn the leaves halfway through. Source: Mother Earth News. For other soft homemade cheese recipes, visit this link to an article in Mother Earth News. Queso blanco, which is Spanish for “white cheese,” is a Latin American specialty with many variations. It is a firm cheese, with a bland, mildly sweet flavor. It is easy to make and an excellent choice if you are in a hurry or if the weather is very hot, a condition that causes problems in the production of many cheeses. This cheese is excellent for cooking, because it has the unique property of not melting, even when deep-fried. It is often diced into 1/2-inch cubes and added to stir-fries, soups, or sauces (such as spaghetti) or used in Chinese cooking as a substitute for bean curd. It browns nicely and takes on the flavor of the food and spices in a recipe. 1. In a large pot, directly heat the milk to between 185° and 190°F, stirring often to prevent scorching. To make perfect poached eggs, crack a chilled egg into a small bowl. Bring a deep pot of water (or milk, wine, butter, stock, tomato sauce, sweet syrup or other flavorful poaching liquid) to a simmer. Swirl the water in a circle with a wooden spoon, then tip the egg out of the bowl into the center of the swirling water. Cover, turn off the heat, and remove the egg with a large slotted spoon at the time specified below for soft- or hard-poached eggs. Make-ahead Tip: Mark Newsome, head chef and co-owner of the Joshua Wilton House in Harrisonburg, Va., gave us this restaurant tip. "We poach eggs the night before if we have large breakfast parties the next day. When the yolks are starting to set, but still soft, we pull them and submerge them in ice water to stop the cooking, and store them in the refrigerator overnight. We reheat them the next day in hot water, which makes the yolks warm and runny." 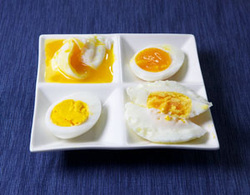 Note: Some people add salt and vinegar to the poaching liquid to keep the egg white firm, but in his esteemed book On Food and Cooking, food scientist Harold McGee recommends skipping those additions if you want a more delicately textured egg. He says not to worry about the especially loose part of the egg white that will detach in the water. Or you can let the loosest part of the egg white separate away from the rest of the egg in your hand before adding it to the water. 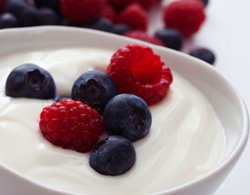 Yogurt is a great way to eat probiotics that support a healthy gastrointestinal and immune system. It can be eaten with fruit, nuts and granola for a hearty breakfast, with honey for dessert, used to make creamy salad dressings or used in place of sour cream as a toping or in baking. Yogurt is easy to make at home! I make yogurt frequently...generally just before my previous batch has run out as it takes a "starter" to make a new batch. It is very simple, even if you do not have a yogurt maker. It is helpful to have a candy thermometer to determine the time to put the starter in (usually between 105 and 115 degrees). However, sometimes I check the temperature based on how my finger feels when I dip it in the milk (it is hot but the heat doesn't burn so I can keep my finger in - luke warm is much too cool though). Use the following recipes from the internet as a guide if you'd like and have fun experimenting with yogurt making yourself. *Greek yogurt is thicker and less tart then regular yogurt, made by simply straining out the whey. You can decide which way you like it. Warm the milk in a medium-sized saucepan, stirring often, until the temperature reaches between 175-180ºF. Allow milk to cool, stirring occasionally, until the temperature reaches between 100-115ºF. Whisk in the yogurt and pour mixture into a large ceramic or glass bowl, or round casserole dish. Starting with a cold oven, turn on the heat for one minute just to take the chill off. Cover the bowl of milk/yogurt with plastic wrap or a lid; wrap with a couple kitchen towels and place in the oven, with the oven light on (to keep it warm). Let inoculate for 8-12 hours or until thickened into yogurt. Stir and store in the fridge for regular unsweetened yogurt or strain out the whey for Greek yogurt. To make Greek yogurt: Line a fine mesh sieve with cheesecloth or a clean dish cloth. Set this over a large bowl. Pour yogurt into the cloth-lined sieve. Allow to strain for about an hour or until the consistency you like (that’s the best part about homemade yogurt, you can make it how you like!). If you are not straining it immediately after you make it, or you will be leaving the house, you can put it in the fridge, it will take a little longer to drain but that’s no biggy. Once drained, pour into a storage container and whisk to smooth it out. Store, covered, in the fridge. Will keep for at least one week in the fridge. If your homemade yogurt is fresh enough you can use it as the starter next time. To do this easily, without feeling like you constantly need to be making a fresh batch of yogurt, you can freeze a tablespoon of your fresh homemade yogurt to save as a starter so you can have it on hand to make it when it works best for you. If you make Greek yogurt you can either discard the whey or put it to use with these smart ideas. Heat the coconut milk in a saucepan to 180F. This will be hot, but not boiling. Sprinkle the gelatin over the milk and whisk in. Let the milk cool to 110F. This is important--- the temperature has to be warm enough to allow the cultures to grow, but if it is too hot they will be killed off. Whisk in the container of coconut milk yogurt. Pour your milk into a yogurt maker and let incubate for 10-12 hours. I leave mine overnight. Refrigerate the yogurt until ready to use. If you want thicker yogurt, lay two layers of cheese cloth over a colander, and set that over a large bowl. Pour the yogurt into the cheesecloth and let drain for an hour or so. First off, I highly recommend getting a yogurt maker, they are inexpensive and so easy to use. I am really happy with this one, but there are many on the market. The key is to find one that allows you to make a large batch, all in one container. It's more versatile, and easy to clean. If your oven has a 60 watt or higher bulb in it, you may be able to store your yogurt in the oven (no heat) with the light on. Wrap it with a towel. You can experiment with different wattage bulbs to get your desired temperature. An electric heating pad or small electric throw blanket wrapped around the yogurt and set on low to medium will do the trick. If you use a heating pad, cover the whole thing with a towel. Whatever method you choose, do not disturb your yogurt while it's fermenting. Homemade yogurt will be thinner than commercial brands due to absence of gums, thickeners and stabilizers. The longer it ferments at room temperature (up to 12 hours), the thicker it gets. To thicken even more, add gelatin, pectin or agar, as instructed. You will need a yogurt maker for this recipe. 1 teaspoon yogurt culture starter or 1 packet yogurt culture mix or use 2 to 3 tablespoons from your last yogurt batch or from a store-bought brand that contains active yogurt cultures. 1. Heat milk in a saucepan (or microwave up to 1 minute) until temperature is at least 180 degrees. Do not boil. 2. Cool milk to between 105 and 115 degrees. (To save time, place milk in the refrigerator for an hour.) Cooling is important as high temperatures kill yogurt culture. If milk forms a skin on top, remove it. 3. Stir in sweetener until dissolved. Add culture and stir well. 4. Pour yogurt into yogurt maker container. Cover, turn on machine, and let sit at least 8 or up to 12 hours, or leave it overnight. You can tell yogurt is ready when a thin layer of “water” about ¼ inch, appears on the top. Yogurt will continue to thicken as it cools. 5. For thicker yogurt, soften gelatin, pectin or agar powder in water. (This step is recommended if using coconut milk.) When it thickens (about 30 seconds), microwave gelatin mixture for 10 seconds or until it becomes liquid. Stir into yogurt and refrigerate until chilled. If even thicker yogurt is desired, add more gelatin. 6. Transfer yogurt to a container, cover tightly and refrigerate. Each cup contains 146 calories, 5g total fat, 3g saturated fat, 0g trans fat, 20mg cholesterol, 126mg sodium, 16g carbohydrate, 0g fiber, 9g protein.TIP For lactose-free milk, try Lactaid (lactaid.com) or Organic Valley (organicvalley.coop). 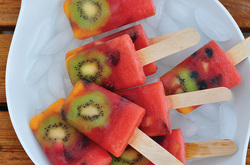 An easy and refreshing treat kids and adults alike will enjoy! You can replace the watermelon puree with honeydew melon or cantaloupe puree. Use any fresh organic fruit you have on hand. I like using contrasting colors because it makes the Popsicles look so pretty! Don’t forget to use seedless watermelon, unless you number among those who enjoy munching the seeds too. When ready to serve, run the popsicle molds under warm water for a few seconds and then pull the popsicles out. Enjoy! Garbanzos or chick peas are a staple food in the Mediterranean diet. These beans are nutrient powerhouses, high in protein, folate and essential fatty acids. Yogurt facilitates a creamy texture as does cooking the beans yourself with a little baking soda, the traditional way to make hummus in some middle eastern countries. Serve on sandwiches, in pita or with your favorite chips or dipping veggies. Note that the yogurt can be omitted to make it dairy free and other veggies and seasonings may be added. Additional Options: 1/2 of a red pepper, roasted in the oven. 1/2 bunch of cilantro. 1+ teaspoon cumin. 1 teaspoon paprika. Combine all ingredients except for the water in a food processor. After all ingredients are combined, add 1 tablespoon of water, pulse again. If consistency of hummus is too thick add another tablespoon of water or more citrus juice. When finished, put in serving bowl and drizzle with olive oil, sprinkle paprika and garnish with a few garbanzo beans, cilantro, parsley or as you like.